We eat a lot of chicken and this Chicken Fajita Recipe was something I came up with to experiment with Mexican flavours. Anything that I can try differently with chicken breasts is great and these chicken fajitas are easy to make and delicious too. They make a fun dinner idea for kids because they can build their own fajitas and if you're a health conscious mom like me then at least you know you're getting a few veggies into their diet. It's also a delicious meal idea for a Mexican theme party so I'll be adding this to my Mexican chicken recipe collection. I'm not a huge fan of bottled ingredients but if you can find a good quality bottled salsa then it's great for saving on cooking time. Of course you are welcome to make your own salsa but then you'll forever after be dissappointed by the bottled kind. First you need to marinade the chicken breasts. Trim the chicken of fat and sinew, and cut into strips. Place the chicken strips in a shallow non-metal dish. Combine the oil, lime juice, garlic, cumin and coriander in a jug, and mix well. Pour the marinade over the chicken then cover it and refrigerate for a few hours or overnight. Preheat a barbecue grill or flatplate to high. Wrap the tortillas in foil and place on a cool part of the barbecue grill to warm through for 10 minutes. Heat the oil on a flatplate. Cook the onion and capsicum for 5 minutes, or until soft. Move the vegetables to a cooler part of the plate to keep warm. Place the chicken and marinade on the flatplate and cook for 5 minutes, or until just tender. 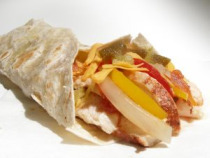 Serve up the chicken, onion and capsicum, cheese and avocado over the tortillas. Top with the salsa and roll up to enclose the filling.